Our specialist commercial blinds will help to control the light, glare and temperature of your office environment. Select from our Solar, screen or blackout fabric ranges or choose a durable and flexible venetian style blind. All available in a full spectrum of colours to suit all areas of your business. In most cases you should install ‘FR’ - flame retardant fabric blinds and curtains wherever the general public have access, this applies to education, leisure, medical and other commercial businesses. All our blinds are fully compliant with current child safety regulations and are supplied with all you will need to install them safely and securely. Room darkening, blackout fabric blinds will block out the most light, for use with white boards. Always select a flame-retardant option to meet fire regulations. ​Simply click below to register as a business user and receive the latest deals and product insights. You can view your quotes, orders and invoice history at any time convenient to you. Our knowledgeable staff have years of experience, we have been making and supplying blinds since 1969. SwiftTrack - Made today – Delivered tomorrow! Have your made to measure blinds made and delivered the next working day using our optional SwiftTrack service. 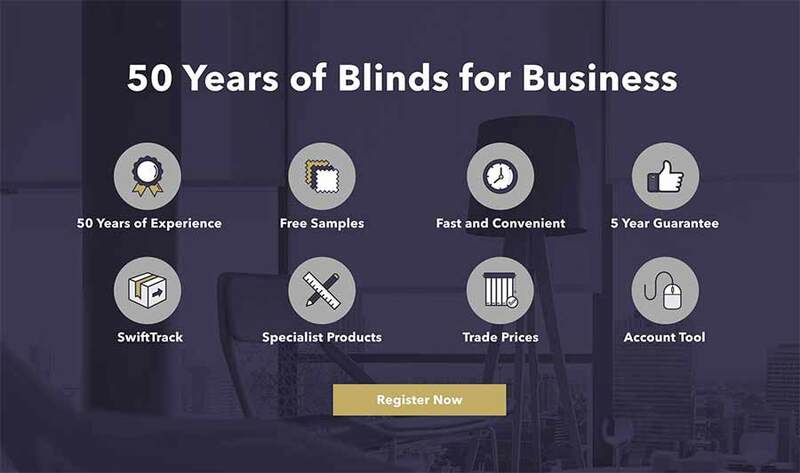 You can trust us, we have been making and supplying quality blinds for all markets since 1969. Selling online allows us to offer the best prices possible as well as special B2B deals. Contact us direct to quote for larger projects. From Flame Retardant fabrics to Office Partition Blinds, you will find just what you are looking for. Samples are available for all our products, delivered FREE next day by First class post. Order online anytime at work or at home or if you prefer, call our dedicated customer support team. Become a Business user NOW! Whether it is Student accommodation letting, building maintenance, furniture rentals or interior design, we have the range of products to meet your needs. Because we manufacture the vast majority of the products, we sell ourselves, we can offer larger sizes, bespoke finishes and wider ranges than many of our competitors. If you need help, get in contact.